KFC is 'dreadful,' says man who brought the franchise to Britain. 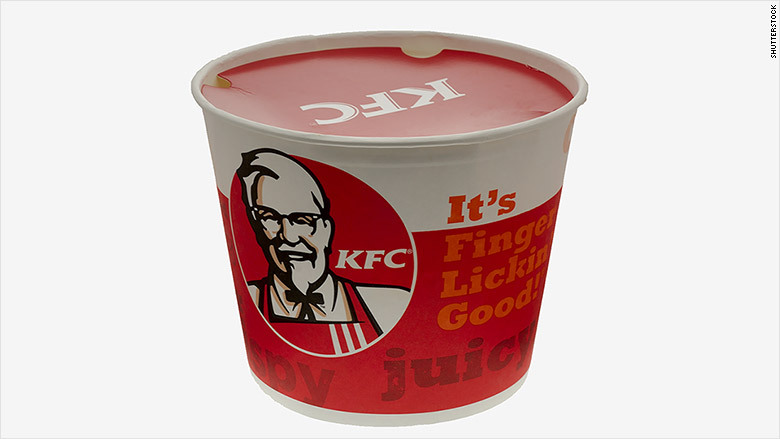 The tub might promise something good, but a British KFC franchisee calls the fried chicken dreadful. KFC isn't what it used to be. The man who brought Kentucky Fried Chicken to Britain decades ago now says the food there is "dreadful" and pledged never to eat at the fast-food joint again. Raymond Allen opened the first KFC franchises in the United Kingdom after a chance encounter with Harlan "the Colonel" Saunders 50 years ago in Chicago, according to The Telegraph. "We have got one where I now live, but I would not go in there," Allen told the paper in an interview published Tuesday. "I don't use it and I think it is dreadful. The company has ruined the product." Allen said that he still has a hand-written copy of the secret recipe for KFC locked away in a bank. But the 87-year-old Allen claims the chicken chain has lost its way. He said KFC now has too many menu items and he doesn't think very highly of any of them. "Instead of staying with one good thing that was sellable, they have tried to compete with the other fast food units," said Allen. "They should have just stuck with the chicken." Allen's wife Shirley, 84, isn't impressed with the food either. "We tried KFC only once about a year ago," she said in the same interview. "We had the traditional original chicken but there were so many different products it was difficult to know what to order. I don't think we will go back." Allen helped spread the KFC franchise across the U.K. before he sold the business in 1973. KFC, a division of global fast-food giant Yum! Brands (YUM), currently has nearly 200 locations in England, Ireland and Scotland. However, Allen said it took some time for Kentucky-style fried chicken to catch on in the land of boiled meats. "In the UK in those days chicken was something you ate for Sunday dinner," said Allen. "It was way before its time. We had to give it away to passers-by initially." But once Britons developed a taste for KFC, it seemed to take off. At one point, Allen was opening a new location every week, the paper said. "We were in a race against time with McDonalds as we both wanted to get the best sites," said Allen. Yet it was a struggle to find financing in the early days. Allen said he "walked the streets of London" looking for a loan because all the banks he went to said there was "no future in the business." Eventually, he was able to raise the £100,000 he needed from an American company, on the condition that he would sell the business once he opened 100 locations, which he did. Allen, who like Saunders was made an official "Kentucky Colonel," couldn't remember the exact recipe for KFC's signature fried chicken, which is widely believed to be made up of 11 herbs and spices. "It is a lengthy recipe," he said. "I think there are 11 herbs and spices but I can't remember it off the top of my head so I couldn't tell you even if I wanted to." Allen said he doesn't get asked about the closely-guarded recipe very often since not many people are aware of his involvement with the company. "I have no idea how much it is worth but I would never sell it," he said.